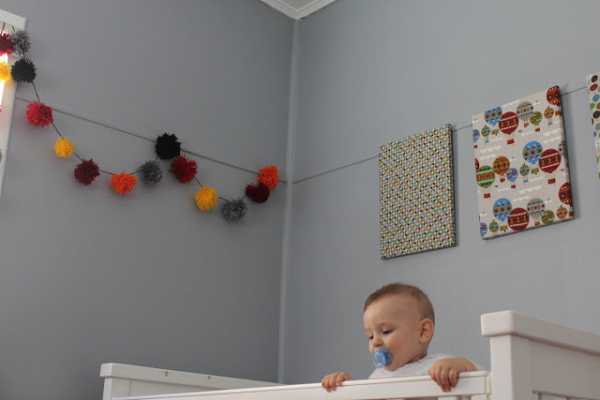 Crafty parents take note – here is what you can achieve in your baby’s nursery with a little imagination and some elbow grease. 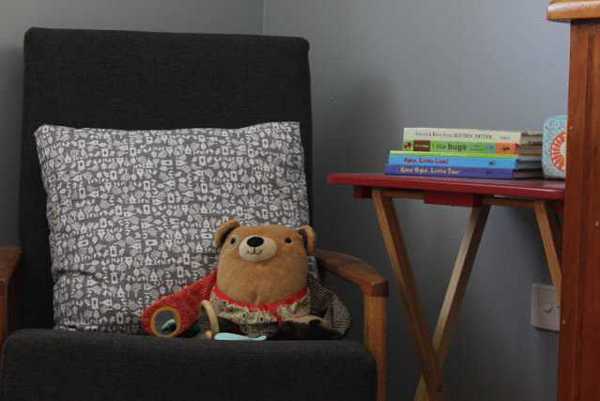 Click through to discover more about how this thrifty space was created. 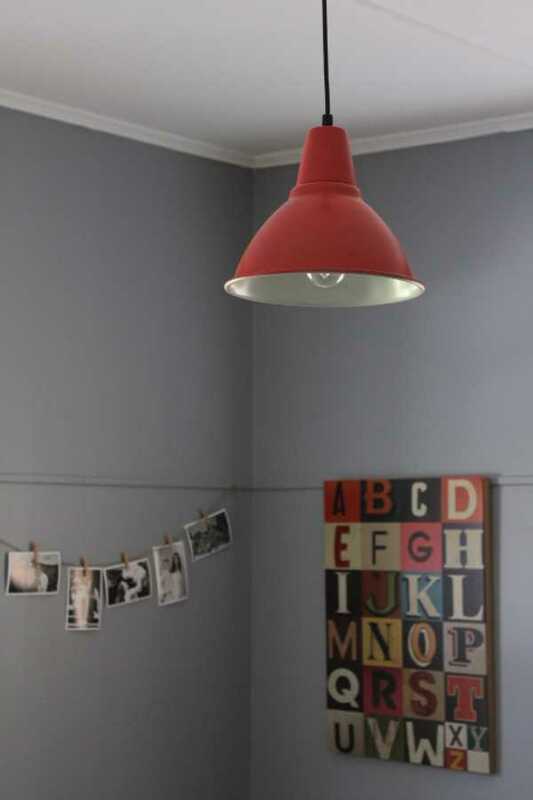 My initial inspiration for the colour of the room was the ABC wall hanging. I loved the colours in the artwork and since my daughter has a very pretty, soft coloured room I wanted to go with a more masculine, rich colour scheme for Malakai’s space. I love being crafty and creating things throughout my home that add a personal touch to each room. 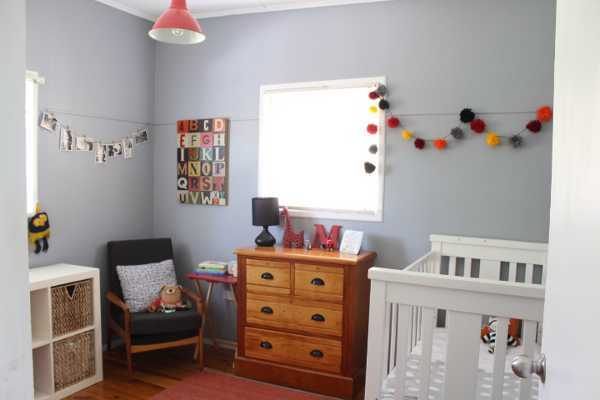 In Kai’s room I made many of the decorations, such as the pom poms, canvas wall hangings, gift wrap name print, the grey cushion and I fully restored and reupholstered the armchair which was a lucky eBay find. The room has come together over the past few months as we have just purchased our first home so I was finally able to paint the walls and hang pictures where I wanted. When we moved in, the room was a bright baby blue colour so I really wanted to redecorate and I love how it turned out. Each of the craft projects were very simple and easy to complete during nap times. 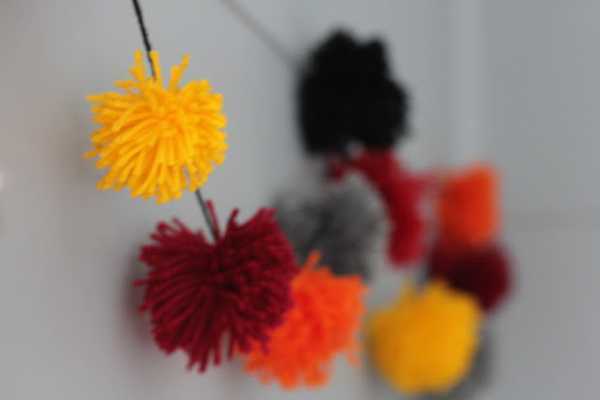 The grey walls of the nursery create a subdued background for pops of colour, from the pom poms, cushions and artwork. 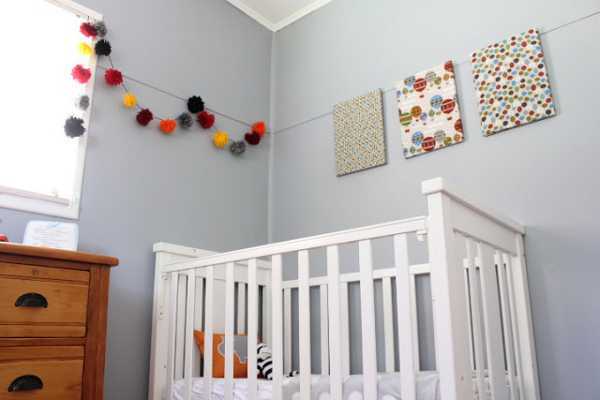 This nursery is great example of creating an amazing space on a budget. 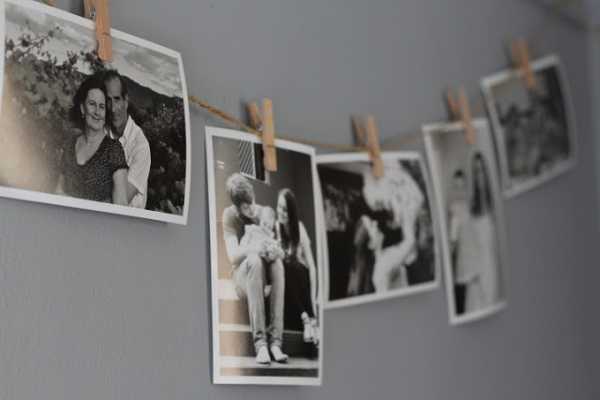 Simple touches like family photos pegged onto a piece of string add charm and personalise the space. Rebecca has provided tutorials on how to make many of the items in Malakai’s room on her blog. And here is the gorgeous little man himself. If something in this beautiful nursery has tickled your fancy, the list below will help you source most of the items in Malakai’s room.